Customer Reviews (4.71 Stars) 7 person(s) rated this product. I Found it...The bass,Mid,Highs. Perfect. Why spend a grand or more when what your looking for is right here. Although one reviewer stated this cartridge's only downfall was it's inexpensive price. I would beg to differ, to point out the insanity of paying more than the price of this cartridge and often getting less. I understand hearing and taste is a subjective matter--and status as per greater dollars spent frequently is none other than an example of conspicuous consumption within the "lifestyles of the rich and ego wounded demographic." 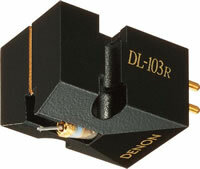 That said, I will admit to have repeatedly chosen this cartridge for use in a turntable/tonearm rig that retails for nearly $15K--and continue to enjoy all the 103R offers. It should be little wonder why not a single large distribution, high-end audio magazine has yet to review the 103R. And when 10 Audio gave this cartridge its highest rating, much back peddling followed after readers revolted. As economic fate would have it, the better the gear with which this cartridge is mated, the more it reveals. Next: to discover comparably priced ancillary gear. I've had this cartridge now for about a month, and it is simply wonderful. On new, audiophile pressings the space it gives everything is marvelous. Really singing harmonics on strings, and great bass thump as required. On older discs I'm hearing a warmth I didn't know was there. A 1964 recording/pressing of London Phase 4 has never sounded so elegant; no harshness I used to associate with the close miking techniques. Very satisfied. Realize, however, that the total cost involved may only be the beginning at buying this cartridge. Output level is quite low, so some form of boost is likely required for many preamps. True fidelity to the source. Performs at a very high level. Tonal balance is essentially neutral, true to the timbre of voices and instruments. High tracking ability. Noisy records are tamed bringing out the music. Free from treble distortion and from sibilance. A pleasure to hear during long sessions. Ample staging and ambience. Specific focus of individual images. Assured aplomb and solidity. Tough. A generous return for money paid. Disarmingly natural, organic, attractive. Suffers only from being too inxpensive. This cartridge is such good value for money it should be on everyones list to try, even those who own megabuck cartridges. It might give some people a harsh reality check. Though not the ultimate in all the 'audiophile parameters', it excels in presenting a solid musical front. With this cartridge, you listen to the music, and not end up analysing it. The way it should be. A true giant killer.